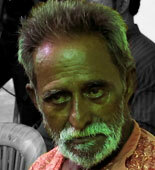 70 year old Dukhushyam Chitrakar is a respected village elder, a poet, a mystic and a master patua at Naya. He was trained by his maternal uncle and learnt the patua songs from his brother-in-law. He is one of the most respected Chitrakar of Medinipur and has taught Patachitra songs to almost all the present day Chitrakars. His art has been showcased in Italy, Australia, Bangladesh and all over India. Dukhushyam`s philosophy of tolerance embraces both continuity and change. Concerned that the village patuas were neglecting the musical dimension of the tradition, Dukhushyam reinvigorated his heritage by doing something unprecedented in the 1970s: training women in the art of the patuas. Though his work is firmly entrenched in traditional mythology, yet he has also painted scrolls on Colonial India and the independence struggle and even contemporary events, inspired by not the market but by the event itself. A prolific writer of Patua songs, he wrote a lot about incidents affecting people`s lives and was even jailed for his efforts during Indira Gandhi`s Emergency.